This story was originally published on Oct. 9, 2016. Later this month, 30,000 spectators will descend on San Francisco’s Cow Palace for the Grand National Rodeo. Since 1941, the Grand National has hosted livestock shows, team roping and bull riding, attracting country and city dwellers from around California. But what most spectators won’t know is that one man has produced this and nearly every other rodeo in the Golden State at one time or another. 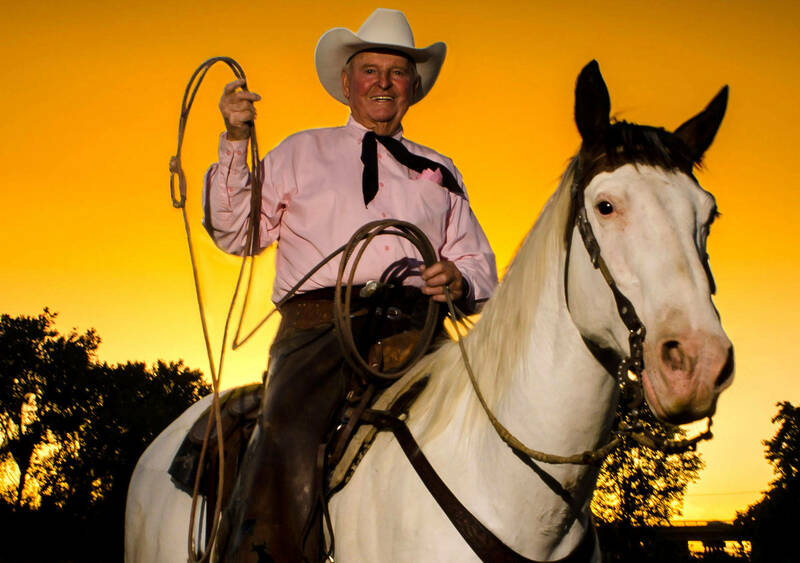 Since Cotton Rosser bought the Flying U Rodeo Company 60 years ago, he has become a legend in the rodeo world. Everyone knows his name. "The loveliest people are in rodeos," says Rosser. "They do it because they love it, and it’s a Western way of life. They love the animals and the horses and the outdoors, and the atmosphere of rodeo is just barbecues and fun." 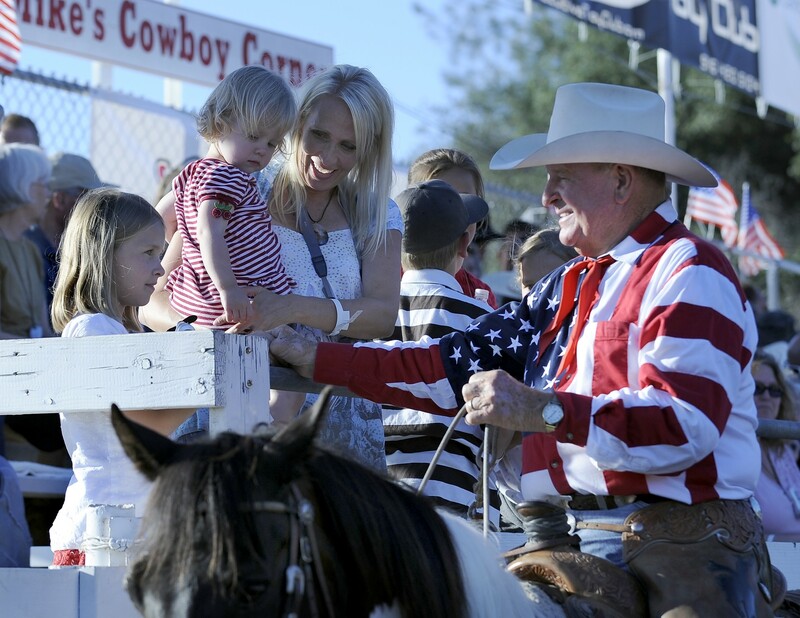 At 89 years old, Rosser has been honored by nearly every cowboy, rodeo or rancher hall of fame there is. He has a place in the Hall of Great Westerners, alongside John Wayne, Ronald Reagan and Dwight D. Eisenhower. But he was actually born a city kid in Long Beach in 1928. He grew up reading books about cowboys and watching Gene Autry, Will Rogers and Hopalong Cassidy. “I wanted to be a cowboy my whole life,” says Rosser. He was barely a teenager when he got a job on Santa Catalina Island, on a ranch owned by William Wrigley of chewing gum fame. At the time there were no cowboys for hire -- they were off fighting in World War II. So they gave young Cotton Rosser a chance, since he only had school half-days. “I used to clean stalls, clean the manure, and they let me ride a donkey named Jack,” says Rosser. And the donkey was just the beginning. Soon, he graduated to riding bulls and saddle broncs, and by the time he was a student at Cal Poly San Luis Obispo, he turned pro. Rosser competed in rodeos all over the country. “[The] Cow Palace, Las Vegas, Reno, Calgary Stampede,” he says. “All the rodeos -- Cheyenne, [and] Pendleton.” In 1951, he even won the Grand National Rodeo’s all-around cowboy title. Then, in 1955, he broke both his legs in an accident while digging post holes on his Marysville ranch north of Sacramento. That ended his rodeo career. “[It was the] best thing that ever happened to me,” Rosser says. He bought the Flying U Rodeo Company and started his career putting on shows and raising rodeo animals. Today, the Flying U is the oldest continually operating stock contracting company in the United States. Since he joined the rodeo world in the 1940s, Rosser has seen the sport change, and at times it seemed like fans were slipping away. To bring more people to the arena, the Flying U Rodeo Company got creative. It added high production value, loud rock 'n' roll, audience engagement and freestyle motocross -- dirt bike riders performing flips off tall ramps. And in recent years, Cotton says these new attractions have boosted attendance. That includes the Grand National Rodeo at the Cow Palace. Rosser says last year’s rodeo broke a 10-year attendance record. Kelley Ferreira is a special projects coordinator at the Cow Palace, and he’s known Cotton Rosser for 30 years. Ferreira and his colleagues are busy getting ready for the Grand National later this month. Cotton Rosser will be at the Cow Palace for the upcoming Grand National Rodeo, but he won’t be running things quite like he used to. In the past several years, his son, Reno Rosser, has taken the reins of the family business. But the elder Rosser says there’s no question he’s going to stay involved. "People catch up with you if you slow down,” says Cotton Rosser. “I love what I do."